Planting trees is a great idea. Trees provide beauty, shade, wildlife habitat and more. And if planting a tree is a good idea, planting a fruit tree is even better! Fruit trees also provide food and jobs. Below is a list of some food-bearing trees that we encourage planting. And if you are interested in tree donations, please find our request form here. Request forms and questions can be sent to info@treesthatfeed.org. Ackee is the national fruit of Jamaica. It is a familiar, delicious, staple dish when served with fish, or sometimes bacon. In fact “ackee and saltfish” is the national dish of Jamaica. Its name is derived from the West African name Akye fufo, which is where the fruit is native. It was brought to Jamaica during the 18th century, along with other fruit, to feed the people. Since then it has become a major feature of various Caribbean cuisines. The ackee tree is an evergreen related to the lychee and the longan. It grows up to 25 feet tall with a short trunk and a dense crown. The leaves are a light, almost luminous green. The fruit has a red outer skin, bright yellow exposed flesh, and black seeds. An ackee tree in bloom is beautiful. There are two bearing seasons, typically January to March and June to August, depending to some extent on rainfall. The fruit is about the size and shape of a pear. As it ripens , it turns from green to a bright red to a yellow-orange, and splits open to reveal three large, shiny black seeds, surrounded by soft, creamy or spongy, white to yellow flesh called the arilli. This is the edible part of the fruit and is only safely edible after it has split open and cooked. Occasionally one hears of an unwise consumer of the unripe fruit who suffers from vomiting due to certain unusual amino acids. Nowadays such accidents are very rare. Ackee is considered a fruit but is cooked and used as vegetable. To prepare Ackee the arils are cleaned and washed. They are then boiled for about 30 minutes and the arils will turn from cream to bright yellow. Ackee is a staple food, high in nutritional value, including protein, unsaturated fat, fiber, calcium, iron, potassium and other minerals. Commercial canning makes the fruit available year-round and also serves as a major export product for Jamaica. In years past, the US government restricted importation of canned ackee but with improved quality control restrictions were lifted. The canned product, produced in both Jamaica and Haiti, is readily available in stores in the US and Canada. The ackee tree grows true to form from seeds. Trees That Feed Foundation is encouraging propagation and more widespread planting for local consumption and increased export capacity. 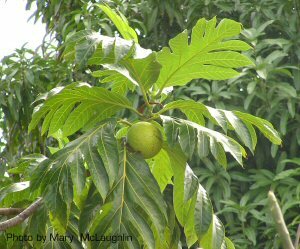 The first tree we have selected is the breadfruit. Research shows it is already well known throughout many parts of Asia, Africa, the Caribbean and Central America. However, breadfruit trees are difficult to propagate. Seedlings are often in short supply because the only traditional method of propagating these seedless trees is by root cuttings. The other difficulty with breadfruit is that the existing cultivars in the Caribbean (introduced in 1793) all bear fruit at the same time, July through October. 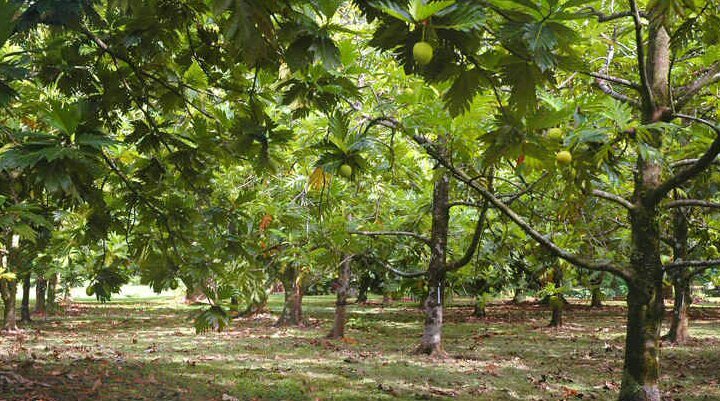 UPDATE: TTFF is conducting a study on breadfruit yield. For photos and more information, click here. Currently the page is still under construction. Because the fruit is not easily stored, it has limited all year use as a starch substitute in the tropics. Researchers at the Hawaii based Breadfruit Institute have identified varieties in the Pacific that bear at different times of the year. They have also perfected tissue culture propagation methods. The plan is to distribute these year-round cultivars as the canopy species. Breadfruit bears a fruit somewhat smaller than a soccer ball. One fruit can easily provide the carbohydrate portion of a meal for a family of five. A mature tree can produce up to a half ton of fruit per year. In controlled orchard settings the trees are heavily pruned for easy reaping. A hectare, planted at a density of 125 trees, out-produces all tropical starch crops, yielding upward of 30,000 kilos of fruit annually. 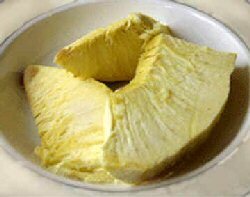 Breadfruit is a true tropical tree that was the basis of Polynesian expansion through the Pacific. Although there is some tolerance to salt and drought, the best cultivars need temperatures in excess of 16 degrees C and rainfall between 1200-3000 mm annually. There are few pests and the trees require little resource once established. The objective of Trees That Feed Foundation is to supply hardened field-ready tissue culture based plants to tropical countries, starting with those countries that are already familiar with the tree. If successful, this has the potential to substantially reduce hunger and to reduce the dependence on now expensive imported corn, rice and wheat. The trees are useful as a carbon sequestration sink, allow understory crops and since this is a crop that does not require annual soil plowing, it helps to conserve soil. Fruiting trees are more likely to be valued and less likely to be cut down. It is ironic that this tree, which was the purpose of Captain Bligh’s famous “Mutiny on the Bounty” voyage, and has the ability to feed so many people, is in decline throughout its range. In Jamaica, for example, there were 2.3 million breadfruit trees in the 1950’s. The number declined to 46,000 by 1986, although numbers have since increased somewhat under a Government program. Heavy marketing, convenience of use and the US crop subsidy programs have caused a steady shift over the past four decades from local foods to imported wheat, corn and rice. The cashew is a tropical evergreen tree native to Brazil. The Portuguese took it to India in the mid 1500’s, and it eventually spread to Southeast Asia and Africa. Today major producers are Nigeria, Vietnam, and India. It is fast growing and an excellent shade tree and food source. Tropical and frost sensitive, the cashew grows best in regions between 25*N and 25*S latitudes. 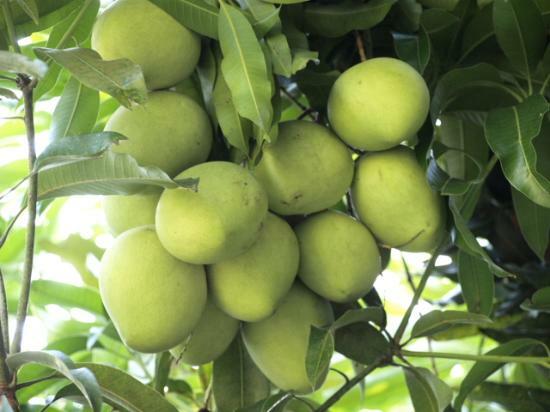 It has a well-developed root system and can tolerate drought conditions as well as sandy soils unsuitable for other fruit trees, but it will not grow in poorly drained soils. This tree has a short trunk and wide branch spread, growing up to 14 meters (46 feet) in height. It blossoms from November to January. Seedling trees flower in the third year, and fruit ripens within 2 months. Seeds (nuts) germinate within four days when lying on wet soil. 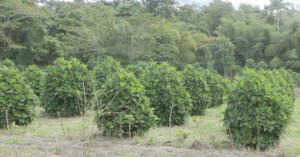 The dwarf cashew grows to 6 meters (20 feet) and is more profitable because of earlier maturity and higher yields. The cashew apple is a pear-shaped fruit, yellow and/or red when ripe, 5 – 11 centimeters long. It is edible with a strong sweet smell and taste. 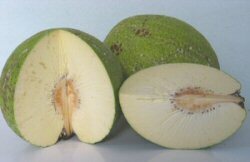 However, because of the juicy pulp and fragile skin, it is unsuitable for transport. Rich in nutrients, cashew fruit has five times more vitamin C than an orange; more calcium, iron and vitamin B1 than other fruits such as citrus, avocadoes, and bananas. It’s eaten fresh, cooked in curries, fermented into vinegar and alcoholic drink, and made into preserves and jams. The apple is more popular than the nut in much of South America, but the nuts are more popular in the rest of the world because of transport difficulties. The true fruit of the plant is a kidney-shaped drupe that grows at the end of the cashew apple. The cashew nut is inside the drupe. When raw, the cashew seed, which we call the nut, is soft, white and meaty. When roasted it changes color and taste. The seed is surrounded by a double shell that contains a toxic allergen related to poison ivy. Properly roasting destroys the toxin, and cashews then are a less frequent allergen than most other nuts. They are a popular snack and food source. Unlike other oily nuts, cashews contain starch and are an effective thickening agent and a source of antioxidants. Cashew oil is used in cooking and salad dressing. The shell of the nut is used in lubricants and paints. Other parts of the plant are used in medicines. Cashew trees are hardy and easy to grow. They have large leaves and fragrant pink flowers that produce highly nutritious fruit. The nuts keep well inside their shells and can be stored for up to two years. The challenge is in avoiding the caustic liquid when shelling the nuts. Mango is a fruit belonging to the cashew family that grows in tropical regions throughout the world. It serves as a main food of many people in tropical countries and is often called the king of tropical fruits. Mangoes are eaten fresh or used in making desserts, preserves, chutneys, pickles, curries and drinks. In India, flour is made from mango seeds. 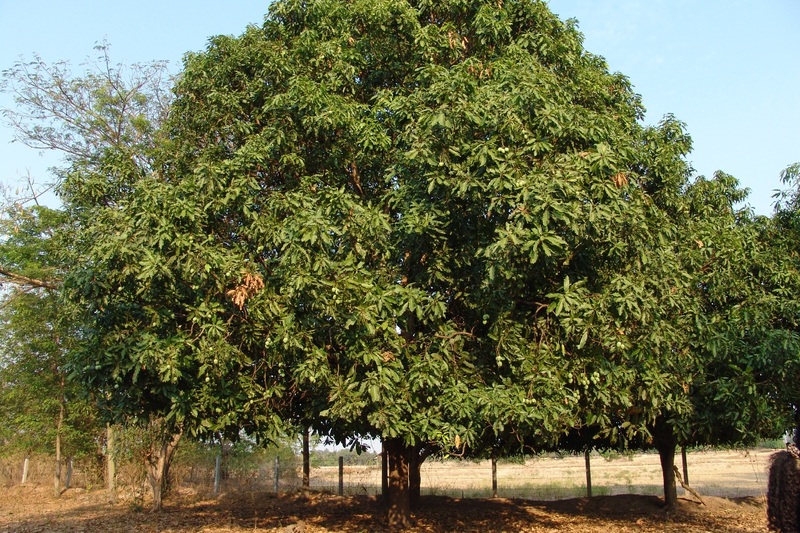 The fruit is an excellent source of vitamins A and C.
The mango tree is an evergreen that grows about 70 to 130 feet (21 to 40 meters ) tall, with a crown radius up to 33 feet (10 meters). It has long, slender leaves that are orange-pink when young, turning glossy red to dark green when mature. The small pinkish-white flowers have a mild sweet fragrance. Fruit develops from the ovaries of the blossoms and ripens about five months after the flowers bloom. Many ripen in summer, and some give a double crop. Ripe fruit varies in size and color. Most mangoes are kidney-shaped, oval or round, depending on the variety. They vary from about two to 10 inches (five to 25 centimeters) in length and from two ounces to five pounds (57 grams to 2.3 kilograms) in weight. Mangoes have a smooth, thin, leathery skin that surrounds a juicy, yellow or orange pulp and a hard inner pit. The skin may be green, purple, or various shades of orange, red, or yellow. Many mangoes have tough fibers in their pulp, and some of the fruits have an unpleasant turpentine-like odor. However, mangoes grown commercially have a soft, fiber-less pulp and a sweet, spicy taste and smell. 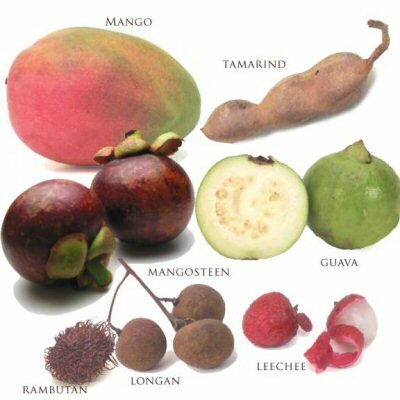 Mangoes were first cultivated about 4,000 years ago in South and Southeast Asia. During the 1700s and 1800s, European explorers brought mangoes from India to other tropical countries. Mangoes were grown in the U.S. for the first time in about 1900 in Florida. Today, they are grown commercially in such countries as Pakistan, China, Thailand, Brazil, India, Mexico, Indonesia and the Philippines. In the U.S., they are grown in Florida and Hawaii. Mango is the national fruit of India, where 1,000 commercial varieties are grown, and it is the national tree of Bangladesh. In several cultures, mango fruit and leaves are used as floral decorations at rituals like weddings, religious ceremonies and public celebrations.. 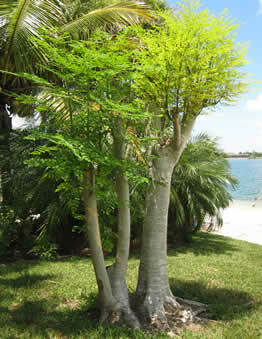 Many people believe that the Moringa trees have great potential to combat extreme poverty and hunger. The nutritious leaves grow quickly, in many different environment types, and can feed people, as well as livestock and sanctuary animals. The leaves contain complete proteins, which is rare for a plant. In many developing countries, Moringa is used as a micronutrient powder to treat indigenous diseases. According to Dr. K. Shaine Tyson of Rocky Mountain Biodiesel Consulting, the defatted meal contains 60% protein, 40% more than soy meal. The high protein leaves can be used as animal fodder and together with the defatted meals, have been shown to increase weight gain in animals by 32% and milk production by 42-55%. The defatted meal can also be used to purify water, settling out sediments and organisms. Moringa trees are prevalent in the drier areas of Africa and India. Moringa can provide oil for making biofuels. The seeds contain 30-50% oil, or 112-185 gal/acre/year. The oil contains 65-75% oleic acids and, unlike Jatropha oil, is beneficial for both humans and fuel. Mor inga is drought resistant and can be grown in a wide variety of poor soils, even barren ground, with soil pH between 4.5 and 9.0. The Moringa Oleifera species is said to have originated in the Himalayas, but although the current cultivars can withstand frost, they do not generally survive a hard freeze. It could probably be grown wherever oranges grow successfully. 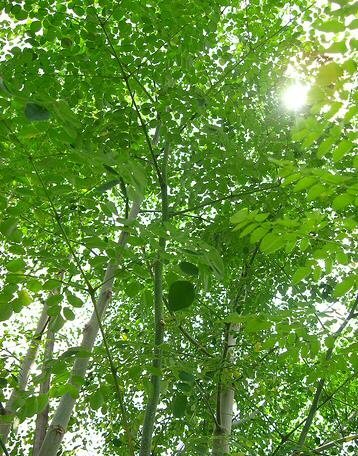 Moringa holds promise as a sustainable crop which can benefit humans and animals nutritionally, economically and as an energy source. Pomegranates are ruggedly attractive trees deeply rooted in human history. Grown in the Middle East since ancient times, Spanish settlers introduced this tree into Latin America and California in 1769. They have been cultivated as a fruit crop plant as well as an ornamental tree. Mature specimens can develop sculptural twisted bark, multi-trunks, and a distinctive overall form. The name pomegranate derives from medieval Latin pomum“apple” and granatum “seeded”. 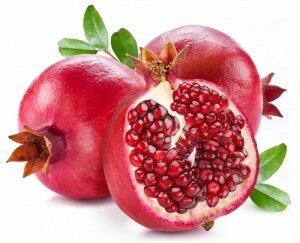 Pomegranates are used in cooking, baking, juices, smoothies, and alcoholic beverages. They are newly popular and more common in commercial markets of North America and the Western Hemisphere, because of the fruit’s healthful level of antioxidants. 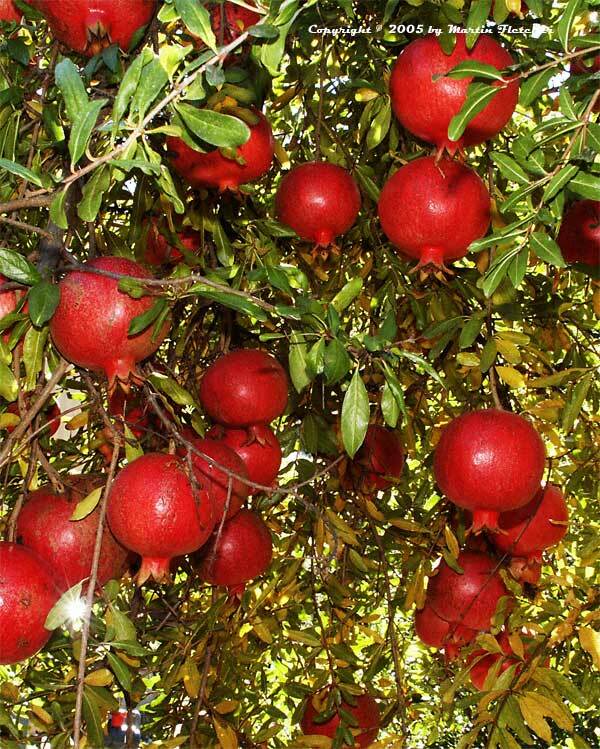 The pomegranate is a fruit-bearing deciduous shrub or small tree growing between 5 – 8 meters (12 – 26 feet) tall. They are self-fruitful, meaning that a tree can provide its own pollen. Commonly plants take 2 – 3 years to fruit and 5 or 6 years to achieve substantial production. Most flowers come in early spring, and these blooms produce the largest fruits. They usually produce mature fruit 5 – 7 months after they bloom, ripening during late summer and early fall. The edible fruit is a berry and is between a lemon and a grapefruit in size with a thick reddish skin. 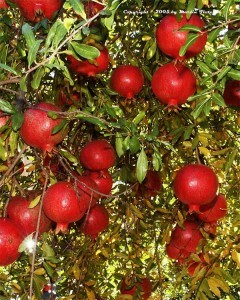 One pomegranate can have 200-1400 seeds, each surrounded by water-laden pulp called the edible aril. Pomegranate trees have been known to live for 200 years, however they become less hearty after about 15 years of growth. Research has shown that the juice of the pomegranate may be effective in reducing heart disease risk factors as well as systolic blood pressure. Juice consumption may also inhibit viral infections. Pomegranate aril juice provides about 16% of an adult’s daily Vitamin C requirement and is also a good source of Vitamin B5 (pantothenic acid), potassium and natural phenols. Fiber and unsaturated oils are contained in the ed ible seeds. Pomegranates are delicious and nutritious fruits that can be eaten fresh, canned, juiced, or made into a jam. TTFF is planting pomegranates as a source of food and drink, and to help bind the soil on Haiti’s deforested hillsides. Mangos are a well known tropical fruit delicacy. Cultivated in many tropical regions and distributed widely in the world, mango is one of the most extensively exploited fruits for food, juice, flavor, fragrance and color, making it a common ingredient in new functional foods often called superfruits. Tamarind is tart and tasty. It is a tropical tree native to Africa. The fruit is a brown pod-like legume, which contains a soft acidic pulp and many hard-coated seeds. Mangosteen is a tropical evergreen tree originating in southeast Asia. The rind of the edible fruit is deep reddish purple when ripe and is often described as a sublte delicacy. Guava originally from Africa, is now widely grown in the Caribbean and Asia. It makes a great healthy snack eaten fresh from the tree. Guava is also used to make preserves and syrups. The trees are relatively small (8 ft ht) and can easily be grown beside houses. Leechee (lychee), Rambutan, and Longan are popular Chinese fruits are about the size of walnuts, with a bumpy shell encasing sweet pulp, similar in texture to a grape. 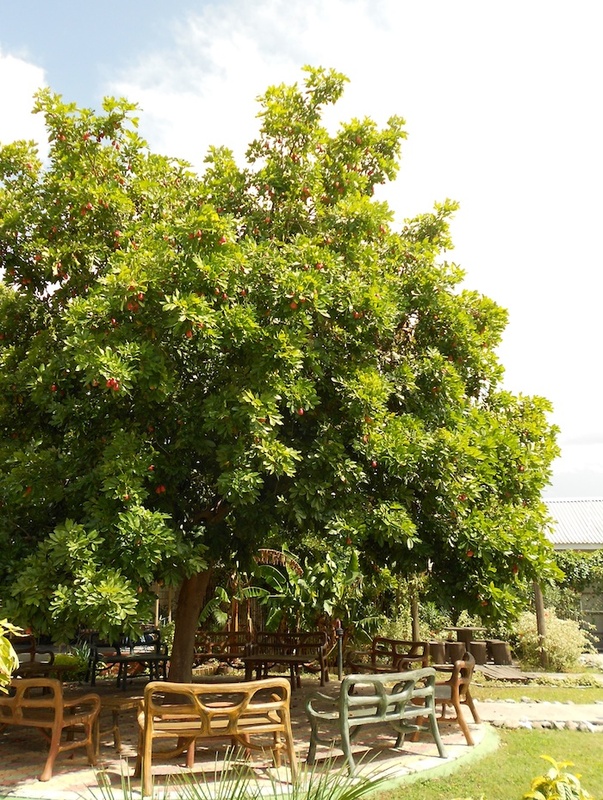 Although this fruit is originally from Asia many of these trees have been introduced to the Caribbean and will be an excellent snack and cash crop for farmers. 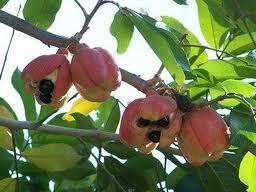 Ackee originated in West Africa and brought to the Caribbean in the 1700’s. The pulp of this fruit looks and tastes like scrambled eggs when cooked, and Jamaicans like to serve it with salt cod. Cherimoya is a South American tropical fruit shaped like a pine cone and has a gray-green, scaly skin. The soft white pulp inside has large black ( inedible) seeds and tastes like a creamy blend of tropical flavors. Jackfruit is the largest fruit in the world–it weighs up to 100 pounds. This fruit is popu lar in the Caribbean, Central America and Asia. The wood is an excellent wood for making houses and boats. Cashew is native to Brazil but is now found globally. It looks like a squishy apple with a kidney-shaped nut at the end. The cashew apple is the yellowish-orange part. 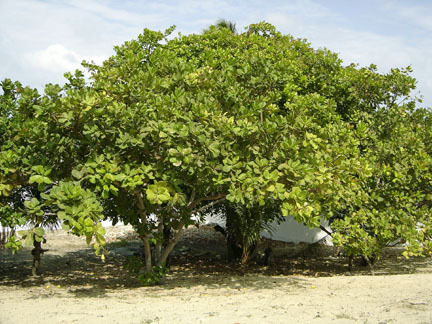 Cashew trees are small and grow well in dry conditions. The Cashew tree produces an excellent cash crop, namely the nut, while producing an edible fruit for the farmer.